The aging of electrical insulation deteriorates its performance causing a wide range of effects from electrical components damage to fatal human injuries or death, that’s why insulation testing is so necessary and must be performed periodically in order to do preventive maintenance and quality control checks. The challenge about testing insulation is to know what to measure, how to measure it and interpreting the results. 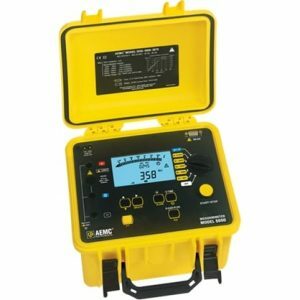 Which equipment should I use to test insulation? The Megger and Doble (Shown in the pictures 1 and 2 respectively) are the most used mega-ohmmeters to test insulation, but we need to be careful given that each of them measures different things. In order to measure insulation, the megger applies a DC voltage previously established by the user and the results will be associated with the DC insulation model of the electrical equipment being tested. This instrument is pretty easy to use but the results aren’t very accurate given that the DC side measures the conduction current which represents just a small percentage (1%) of the total leakage current. In order to know the actual state of the insulation, we need to take into account the AC part which can be measured with the help of a Doble. This instrument is way more difficult to use, and you need to know the insulation model of the electrical equipment being tested in order to know what you’re measuring, which testing mode should be used (yes, this instrument has several testing modes) and check the results. If you’re using a Megger you have several indexes that can be used to determine the integrity of insulation. For example, the Polarization Index (PI) is the ratio of the mega-ohms measured after ten minutes divided by the mega-ohms after one minute, and it’s mainly used to test insulation on motors and generators. 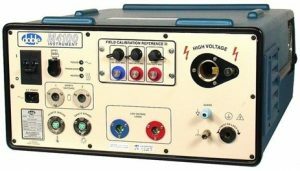 Also, we have the Dielectric Absorption Ratio Test (DAR) which is the ratio of the mega-ohms measured after one minute divided by the mega-ohms after 30 seconds, and it’s widely used to test transformers. If using a Doble it’s recommended to verify the results comparing them with the values provided by the manufacturer if available. One important thing you must know about electrical insulation testing is that the procedures vary depending on the element you are attempting to test, this all makes sense given that every single element works in a different way, but what you’re measuring is the same: electrical resistance. When working with single-phase transformers, you want to test the insulation winding to winding and winding to ground. If you are dealing with a three-phase transformer, you’ll need to measure electrical resistances between phases for delta transformers and phase to ground for wye transformers. Other types of transformers must be studied carefully. Similar to transformers, testing motors and generators is about measuring the electric resistance between windings and windings to ground, while the machine is entirely disconnected. If you are testing a dc machine, you must take into consideration that your results could include the resistance of the brushes. In order to avoid any inconvenience caused by damaged insulation, there are many types of equipment and electrical elements that require periodic insulation testing, and each one of them should be performed following different procedures, so in order to get accurate results, a previous research should be done to make sure that we’ll get doing it right. or copy this trackback: http://engineering.electrical-equipment.org/safety/the-importance-of-insulation-testing.html/trackback from your own site.